Hours: 11:00am – 3:00pm (M-Th), 11:00am – 7:00pm (F), 1:30pm – 6:30pm, (Sat), closed Sundays. Also on Street Food App. Green factor: Metal trays for dining in, not sure about take-out. Garbage and recycling bins, no compost. 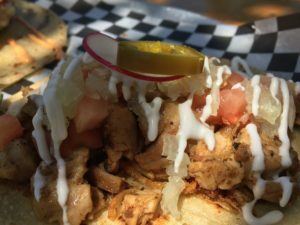 Coming from Halifax, where there’s not a lot of good options for Mexican or Central American food (or many other international cuisines, for that matter), I appreciate the greater diversity of Ottawa’s food scene. And that makes a taco truck like Nacho Cartel enough of a draw to get me to bus across town on a sunny summer day to sample their wares. 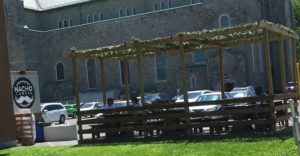 Located on the periphery of the University of Ottawa campus, Nacho Cartel has a nice little setup on the go, with a trellised patio gives them a quaint little seating area that most food trucks don’t have. Their menu that day was comprised of tacos, nachos (duh! ), as well as taco salads. You have your choice of proteins (beef, chicken and shrimp) as well as going vegetarian. Their tacos are sold individually ($5 – 6 each), and I appreciated the flexibility to mix-and-match the different kinds. I swept the proteins, getting the beef, chicken, and Utila shrimp, and a bottle of water to cool any potential burn. I moseyed over to the patio while I waited for my food, and enjoyed the reprieve from the sun offered by the trellis and the fake greenery it supported. It wasn’t long before my name was called and I had my tray of tacos in hand. on’t need one that can’t close, or completely falls apart because it’s so overloaded. My first target was the shrimp taco since the shrimp was battered and I wanted to get at it before it got soggy. The tempura-style batter was airy and crispy, and the shrimp was perfectly cooked – firm, but still moist and tender. 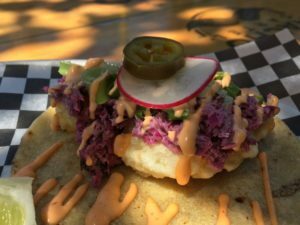 A slaw of red cabbage and green onion kept the taco light and added to the crunch factor, while a lone radish and pickled jalapeno (which was on each taco) added some more depth of flavour. Their house-made spicy crema gave a further kick, but wasn’t overwhelming. 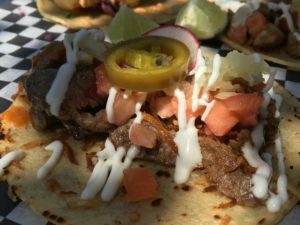 The beef taco was topped with a fresh salsa and crema, and I was pleased to see that the meat wasn’t overcooked or dry – a danger for any meat on a food truck that may have been cooked ahead of time in a commissary kitchen. The tang of the tomato salsa played well against the beef, and overall it was simple, but tasty. I have to crown the chicken taco as my favourite. Along with the well-executed meat and the same toppings as the beef taco, some crispy onions beneath the meat added a nice little crunch, and pops of flavour. If you’re in the area, it’s definitely worth going a little off the downtown beaten path to get these tacos. 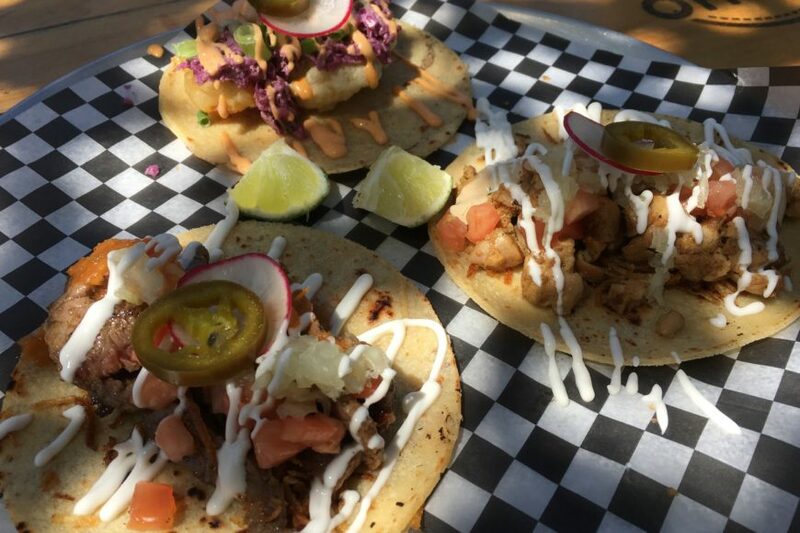 They may be the Nacho Cartel, but they’ve got their tacos on lock.